To eat or not to eat, that is the question. I have stated before one of the challenges faced with getting your morning coffee at a donut shop is temptation is always looking you right in the eye. I am always good at avoiding the sugary delights on my own, but sometimes it will happen. One of my fellow patrons bestows me with a gift. Now what can one say to a free treat. It has to be one of the best ways to start your day. Someone gives you a gift for no reason except to put a smile on your face and to just give you something truly enjoyable. I am all of a sudden filled with pure gratitude at how thoughtful people can be, but I am now I am faced with a morning struggle I was not anticipating. 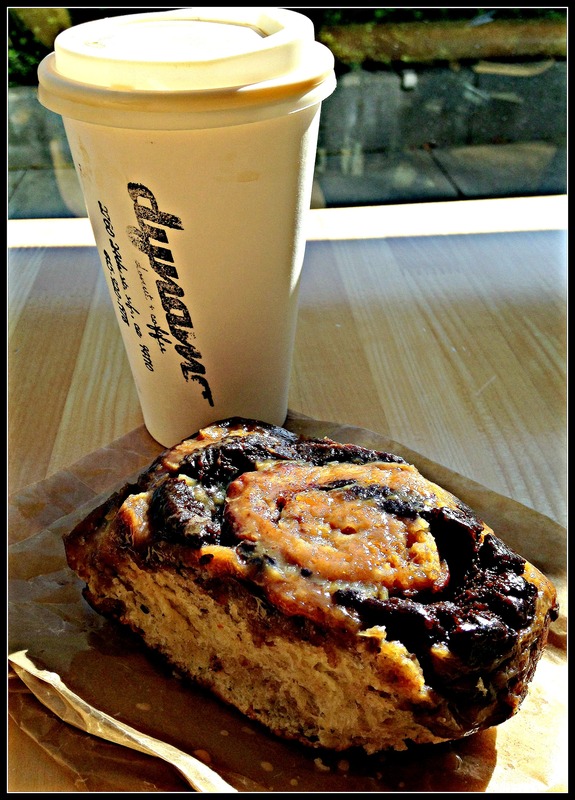 This morning the Sticky Bun was the gift given to me. Now I have never really been a sticky bun fan, however dynamo donuts version looks to be a in a whole different ball park. 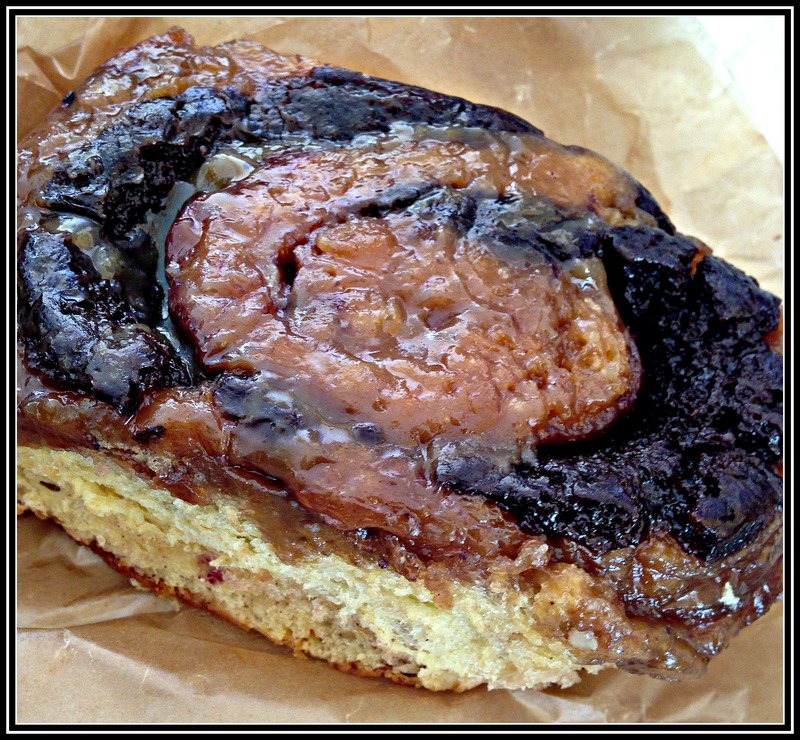 Dynamo makes their sticky bun from leftover donut dough and then it is baked in a sticky sauce. My eyes start to tell me I want it, however my mind knows eating it would completely derail the hour long spin class I just did. After how torturous getting through spin was this morning there is no way I can negate all of those calories I just burned for one pleasurable moment. Yes it will taste delicious for a minute, but then after the sugar spike wears off the sick feeling and tiredness will start to creep in. However to pass up something so good would also be a sin. Here is the compromise I made with myself. I cut off a small sliver of the bun so I can try the sweet, sticky, doughy, goodness. I then decided to surprise a close friend at work with the rest of the sticky bun. Now I am careful as I would not want to put someone else in this same morning dilemma. Therefore I had to pick a friend who loves sweets and would feel truly excited about the early morning indulgence. Now I have been able to pass on the feeling I just received of enjoyment from being surprised with an early morning gift to kick off their day. Hope everyone can pass on a surprise to someone else this Wednesday morning!